It seems Lenovo has got into the habit of simultaneously launching multiple devices for the Indian market -- targeting some diverse price segments at the same time. In June this year, the company launched its phablet offering called K900, along with five other smartphones (read here for more on that). And this time around, it has launched a couple of tablets, targeting both 7 and 10 inch segments. The devices, namely, A1000, A3000 and S6000, have been priced at Rs 8,990, Rs 16,000 and Rs 27,000, respectively. All of them run on different versions of the Android Jelly Bean operating system. Here is a quick look at the specifications of the tablets. We have also added a table, comparing the key features of the three tablets. This tablet has a 7 inch TFT capacitive touchscreen display (600Ã—1024 pixel resolution) and runs on the Android 4.1.2 Jelly Bean operating system. It is powered by an MT8317 1.2 GHz dual core processor, has 1 GB RAM and comes with multiple internal memory options including 4, 8 and 16 GB. In addition, users can also expand the internal memory by 32 GB with a microSD card. The device sports a 0.3 MP front-facing camera for video calling, but there is no rear camera. On the connectivity front, it has Bluetooth 4.0, Wi-Fi, a microSD card slot and a microUSB port. It has a 3,500 mAh battery that the company claims will provide up to eight hours of browsing, six hours of video playback and two weeks of standby time. The tablet measures 199mm x 121mm x 10.7mm and weighs 340 gm. It comes with GPS and will be available in black and white colours. This one has a 7 inch IPS LCD capacitive touchscreen display (600Ã—1024 pixel resolution) and runs on the Android 4.2 Jelly Bean operating system. 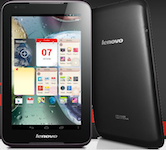 It is powered by an MT 8389/8125 1.2 GHz quad-core processor and has 1 GB RAM. You have a choice between 4 and 16 GB of internal memory, which can be expanded up to 64 GB with a microSD card. The device sports a 5 megapixel autofocus rear camera that can record videos and a 0.3 MP front-facing camera for video calling. On the connectivity front, it has Bluetooth 4.0, Wi-Fi, a microSD card slot and a microUSB port. It has a 3,500 mAh battery that will provide up to 7 hours of browsing and two weeks of standby time. The device measures 194mm x 120mm x 11mm and it weighs 345 gm. The tablet comes with GPS with A-GPS support and will be available only in black. The big brother of A1000 and A3000 has a 10.1 inch IPS HD capacitive touchscreen display (800Ã—1280 pixel resolution) and runs on the Android 4.2 Jelly Bean operating system. It is powered by an MT8125 1.2 GHz quad-core processor, has 1 GB RAM and comes with 16 GB internal storage, which can be expanded up to 64 GB with a microSD card. Similar to the A3000, this one also has a 5 megapixel autofocus rear camera that can record videos and a 0.3 MP front-facing camera for video calling. On the connectivity front, the device has Bluetooth 4.0, Wi-Fi, a microSD card slot, a microUSB port and a microHDMI port. 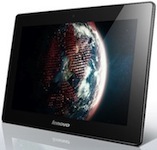 It has a 6,300 mAh battery that will provide up to nine hours of browsing, according to Lenovo. The device measures 259mm x 180.34mm x 7.62mm and weighs 562.4 gm. 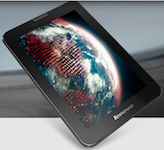 The tablet comes with GPS with A-GPS support and will be available only in black. Users can also make use of a Bluetooth keyboard with magnetic attachment, specifically designed for this tablet.